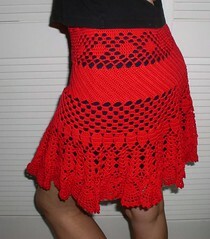 CLF Member Liana made this fabulous skirt! It totally sets our picot free! Fun, sassy, and red hot! The pattern is by Patricia Pepe. Congratulations Liana! This is a fabulous, fun and fantastic skirt! You are duly awarded the Crochet Liberation Front Set My Picot Free Award for outstanding crochet!